This review is 99.9% spoiler free! No innovation in boardgames has been as controversial as the Legacy system, and that includes the Queen’s rise to power in Chess back in the 15th century. If you don’t know Legacy yet, it’s a family of games where each time you play you make permanent and irreversible changes to the game. Put stickers on the board or on cards, rip up old components(!!! ), open packs with new components – all changes that will make the next game you play very different indeed. Changes that will also make your copy of the game completely unique, because they are scripted in a way, but depend on player decisions and random events as well. When you’re done with the game, it will be the result of your game groups efforts. That “when you’re done with the game” is the big point of the Legacy system’s opponents. You will be done with the game at some point. There are a limited number of plays in the box. A Legacy game comes with a sort of planned obsolescence, and when you have reached it you can’t play the game any more – not as intended, at least – you can’t sell it, nothing, it’s over. The system’s opponents are right in this view. The proponents hold against them that the Legacy system creates a previously unknown depth of engagement, a feeling that every decision really matters even beyond the end of this game. They say that you truly make a copy of a Legacy game your own. You mark it forever, and it’s something to be proud of when you complete it. They are also right. A lot of what will happen in a Legacy game is hidden at first, in boxes and envelops, hidden from the players. Opening new components should always be a real surprise. I haven’t played Risk Legacy, the first Legacy game, so I don’t know about that one, but Pandemic Legacy also tells one continuous story that you advance with every game. It’s very much like a modern TV series in that respect, which is why the game is subtitled Season 1. That creates a completely new problem for us reviewers: spoilers. Giving away the plot twists in a review seems unfair to future players, so we will not talk about the plot, only about rules and components you know from the start. One tiny exception: you will see some sticker in the photos that are introduced later, but they are completely generic and don’t tell you anything about what they mean. So, after all this introduction, lets go. The basics of Pandemic Legacy are identical to good old Pandemic. In fact, if you have never played Pandemic before the rules recommend you ignore the Legacy bits for your first few games and play regular Pandemic, and then start the story when your comfortable with it. I’m not going into all the Pandemic details here, if you’re interested in those I recommend our first ever review. But let me just tell you the basics again. Up to four players, in the roles of disease experts, must travel around the world to fight four different diseases, represented by different colors of cubes. 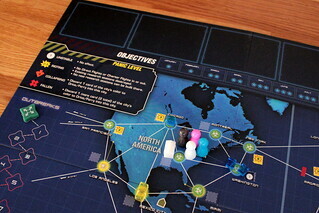 As with most cooperative games, Pandemic alternates between player actions and game events. On their turn, a player has four actions to use to travel around the world, treat diseases and use their hand cards to find a cure for a disease. Finding the cures for all four diseases is the only way to win Pandemic. To find a cure, you need five hand cards in the disease’s color. That sounds easy, but is actually quite tough between a hand limit of seven cards, using the cards for long distance travel and to build research centers as well and the difficulty of trading cards with other players, which can only be done in the right location. And, of course, being distracted by having to cure people. 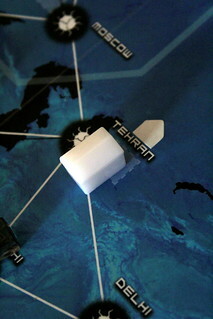 After each player’s turn, the game strikes back and puts new disease cubes in random cities on the board – well, semi-random, really, the very simple mechanic of putting the discard pile for infections back on top of the draw pile makes sure that some cities develop into hot spots while others remain entirely unaffected. Having hot spots is bad because you can only have three disease cubes of the same color in one city. If you have to add a fourth, you get an Outbreak instead and add one cube of that color to all cities connected to the one with the Outbreak. If one of them already has three cubes as well, you get a lethal chain reaction. That’s bad for two reasons. One: if you ever get eight Outbreaks, you lose the game. Two: if you run out of cubes in one color, you lose the game. It’s all really pretty simple, mechanically speaking, but even regular Pandemic is still one of our favorite cooperative games because of the tension those simple mechanics create. Getting back to Pandemic Legacy, then. When you open the Pandemic Legacy box, you will notice four things you don’t have in regular Pandemic. 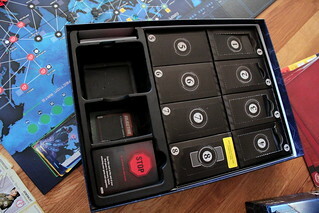 There are eight black paper boxes with additional components and some sheets with closed, numbered doors behind which stickers are hidden. You will eventually open most or even all of those, and all of them add new things to the game.We will not talk about their contents, because there’s nothing there that wouldn’t be a spoiler. 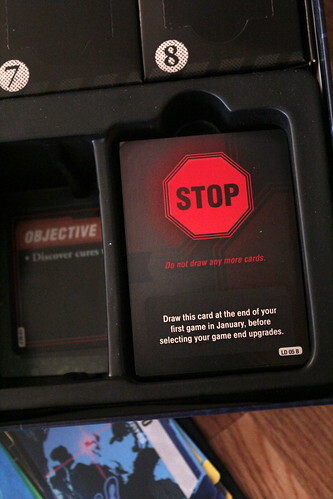 Next, there is a large stack of cards, marked with a large STOP sign. Those are the Legacy cards, the story of the game. Pandemic Legacy is played in 12 months, each month is one game. If you fail a month once, you get a second chance. If you fail again, you still advance to the next month. So, in theory, if you lose every single time, you can play Pandemic Legacy 24 times. We wouldn’t recommend doing that on purpose, though. It might of course happen accidentally, but it’s not all that likely because some balances are in play. Losing a game always means that you will have more special event cards for the next game, and they help a lot. Winning a game, on the other hand, gives you fewer special events for the next game because, as the rule book says, you clearly have the situation under control. Also, if you’re doing really badly there is one of the black boxes with a sign to open it after you lose four games in a row. The Legacy Deck tells the story for every month. You go through it from top to bottom, and the cards tell you when to advance. Usually at the start and end of a month, but sometimes things happen in the middle of a game, too. You will learn to fear the event marker that reminds you to open the next Legacy card! Finally, there is a large sheet with stickers, and since they are open from the start we can talk about them without fear of spoilers. A large part of the sticker sheet is taken up by Panic Level stickers. Whenever there is an Outbreak, the Panic Level in that city goes up one step, up to a maximum of five. Since the numbers are on stickers, they stay around for the next game. That’s not a problem at first, Panic Level 1 has no effect. But at level 2-3 (Rioting) you can not use a card for long distance travel to or from that city any more. Things get really bad at level 4 (Collapsing) when you have to discard a card for a regular move into the city and 5 (Fallen) when that effect goes up to two cards. Here’s where long term planning becomes important, because some cities hit you harder than others when they fall. Discarding two cards to enter New York, for instance, the only city in North America from where you can cross the Atlantic, will mess up your game forever. Losing Washington is tragic, but much less devastating for future games, at some point you’ll have to play favorites. Being in a city when it falls is also one way to permanently kill a character. When that happens, you rip up the character card. That character is dead and can’t be played in any future games. Instead, you will use a Civilian card without any special abilities. The other way to kill a character is to receive a third Scar. Scars are another set of stickers on the sheet, they are applied to a character card when the character is in a city while it has an outbreak. Scars give a character some permanent disadvantage, like a reduced hand limit or needing an additional card to research a cure. That’s easy enough to avoid, but you will come to the point where the only way to win the game is to step into a city you know will have an Outbreak. You won’t forget that first heroic sacrifice. That all sounds pretty grim, but there are some nice things, too. After every game, no matter if you won or lost, you get to apply upgrades. At the start, your options are: upgrade a character, mutate a disease or add a starting research center. Upgrading a character works like a scar, only that the effect is beneficial and a third upgrade doesn’t kill you – it replaces a previous one. Mutating a disease, in this case, means a beneficial mutation that makes the disease easier to cure. You can only apply this upgrade to a disease that was eradicated in this game – you had a cure and removed all cubes from the board – and makes it easier to research a cure in the future. For a starting research station you apply a sticker to any city where you have a research stations in this game, and in the next game it will still be there. There is even more long term planning in these upgrades, and they sometimes make players take crazy risks to make future games easier: “No, don’t win the game yet, with one more turn I can eradicate red and we can mutate it”. That is often followed by really bad things happening and you losing the game. While that is everything you know before your first game, there are many more things that will happen during your campaign. There will be more permanent changes to everything. You will learn actions beyond the basic actions you already know. You will change the world forever. And you do all that following a plot you didn’t see coming. It’s tense, it’s immersive, it makes people beg to play one more game two hours after they wanted to go home. It’s the only game where players say “Oh crap, why did we do that three games ago?? ?” I have to admit, we did mess up Europe rather badly. The campaign has a steadily rising level of difficulty, some of it driven by your own decisions, but it never crosses the line from challenging into unfair. So if you ask what side of the discussion about Legacy games I stand on, let me say this: I wouldn’t want every game to be a Legacy game, that would be silly, but Pandemic Legacy is the most amazing boardgame experience I remember having.